May 21. That's the day that Microsoft will, finally, put an end to all the rumours and speculation and heresay and whispers about the successor to the Xbox 360 and actually show us something. Or at least tell us something. Either way, make it official. More so than the reveal of the PlayStation 4 earlier this year, it will be a relief for those who follow the video game business on a daily basis because, more than any other system in living memory, it feels like we know everything about the system already. Actually, no, it feels like we know too much. Years of leaks and rumours have painted an enormous, ever-changing landscape of what we think this new console will be about and how powerful it will be. There have been so many reports that they've all blurred into one unwieldy mess, made more cumbersome by the fact Microsoft has, until now, refused to even acknowledge the presence of a new console, let alone comment on it. 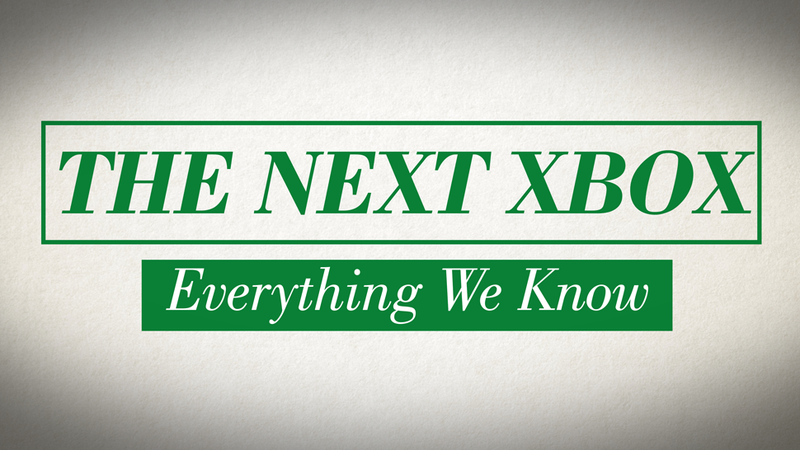 Ahead of this reveal, then, we figured now was a good time to round up everything we know - and everything we think we know - about the next Xbox. To make things easier, I've divided the rumours into three categories: those Kotaku (or other major outlets) have reported having heard from sources close to the development of the console, or the development of games for the console, those a little further afield, and thus to be taken with a few more grains of salt, and stuff we know absolutely nothing about. Note also that much of the information you'll read below comes from Microsoft's internal development documentation for the console, which we've read. You will be using Kinect, whether you want to or not. The second (and vastly improved) iteration of Microsoft's Kinect camera won't just be shipping with every console, it'll need to be plugged in and calibrated for the machine to even run, suggesting a deep level of integration with the next Xbox's user interface. If the controller ain't broke, don't fix it. Microsoft's control pad for the next Xbox is described as a "natural evolution" of the current controller. Expect slight revisions, not major changes. Also, your 360 controllers won't work on the new console. Sorry. Specs. Specs. Specs. The next Xbox will run on custom hardware that includes an 8-core, 64-bit CPU running at 1.6ghz, an 800mhz DirectX 11.x graphics processor and, alongside them, various "custom hardware blocks" that are able to handle certain individual tasks, taking the strain off the main CPU. There's also 8GB of DDR3 memory (at least in dev kits), a 500GB hard drive and built-in wi-fi. Oh, and it'll also use Blu-Ray discs. Your friend in green. The Xbox Companion App, already available for the current generation, is being overhauled and improved, and will give your tablet or phone many of the same capabilities Nintendo uses for its Wii U control pad screen. It can juggle your games. Just like the PS4, the next Xbox will be able to "hot swap" between programs, and will also be able to pause your game like a phone does - freezing the exact moment you close it down - instead of the more traditional save-game system. Install on the go. You won't need to install games for the next Xbox. The system will do that for you while you play. Taking over your TV. The next Xbox has a HDMI in port, which it seems will be used to turn your console into a fully-functioning TV box. Goodbye, Durango. For years now, the console's working title/codename internally with Microsoft and developers has been "Durango". Hope you haven't gotten too attached to it, though, because come May 21, it'll surely be gone, replaced by the machine's actual name. It'll probably be out in 2013. Kotaku, and several other outlets, have all been told the machine will be out in time for the 2013 holiday season. At least in the US. That it requires an "always-online" internet connection. This one's strange. We've heard from some sources that the console will definitely need to be online to start playing games. Others have said this isn't the case. Some are even suggesting that it's the console's entertainment and TV capabilities that will need this, not your games. Because of this confusion, it goes in the maybe pile. It might block you playing used games. It might not. While both Kotaku and Edge have heard from sources that the console could somehow block consumers from playing used games - presumably until they purchase some kind of "online pass" - we've yet to hear decisively on the matter. There's also the chance, like the "always-online" feature above, that Microsoft has tweaked - or even removed - the feature following negative feedback from customers. Xbox chat is gone. One interesting report from CVG said that the console's chat services would all be brought under the Skype brand umbrella. What's especially neat is that this raises the possibility of "asynchronous voice and video messages in next-gen Xbox Live". Games! Because the console is yet to be officially announced, no games have been officially announced. Several have danced around this, though, saying they're either coming for "next generation" consoles (without specifying) or that in addition to systems like the 360 and PS3, further platforms will be announced in the near future. Some of these games include the likes of Assassin's Creed IV, The Witcher 3, Watch Dogs and FIFA 14. What it looks like. To dissuade leaks, and to help track them down if stuff does spill out, Microsoft has covered its development consoles (and controllers) in what's essentially dazzle camouflage, which doesn't just help disguise the lines of the devices, but also identifies who owns each one. Xbox Live 2.0? Achievements? Dashboard? Most of what we know so far about the console has to do with its hardware and specifications. When it comes to things like Xbox Live, achievements and the next console's user interface, we're mostly in the dark. That's it for the important stuff. Whether the information revealed by leaks, reports and sources over the past two years turns out to be true, mostly true or barely true, I guess we'll find out on May 21!